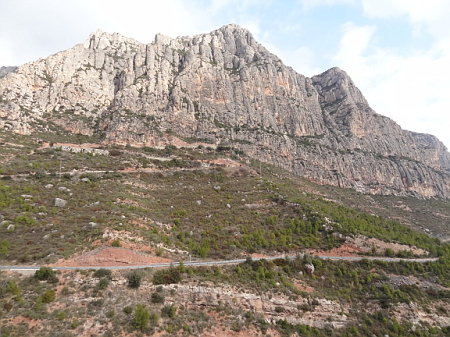 The Collbató caves are located in the pre-coastal mountain range on the lower southern slopes of the mountain of Montserrat, west of the river Llobregat. The caves coincide with a progressive unconformity on the north bank of the Torrent de la Salut. The Collbató caves are an excellent example of karst scenery located in the iconic Montserrat Natural Park with close proximity to the Barcelona metropolitan area. Montserrat is one of the Eocene coastal ranges bordering the southern edge of the Ebro basin, being the product of erosion of the Catalan Coastal Ranges. These ranges are small units thrust northward over the Ebro basin, creating progressive unconformities. This deformation occurred during the Alpine orogeny. There are a series of outcrops in the Collbató area that clearly show the development of tectonic structures with simultaneous deposition of alluvial fans on the edge of the basin. The area has been inhabited since at least 4000 BC, as shown by Neolithic remains found in the caves. In the sixteenth century, the monastery received 12 pounds per year from the lease of the caves for the extraction of sodium nitrate (saltpetre). There are numerous inscriptions inside the cave with dates ranging from 1511 until 1780. 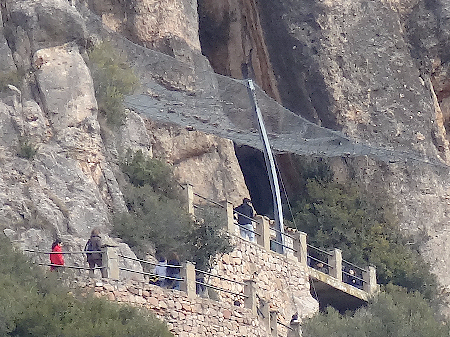 Entrance to the caves protected from rock falls by steel mesh. An unconformity is a contact between two rock units in which the upper unit is usually much younger than the lower unit. In general, the older layer was exposed to erosion for an interval of time before deposition of the younger, but the term is used to describe any break in the sedimentary geologic record. An unconformity represents time during which no sediments were preserved in a region. The local record for that time interval is missing and geologists must use other clues to discover that part of the geologic history of that area. The interval of geologic time not represented is called a hiatus. A conglomerate is a rock consisting of individual rounded clasts within a finer-grained matrix that have become cemented together. Conglomerates are usually deposited by high energy processes since it takes a strong water current to transport particles large particles. The environment of deposition might be along a swiftly flowing stream or a beach with strong waves. A smaller clast or a thinner clast is usually associated with a beach or shallow marine environment. There must also be a source of large-sized sediment particles somewhere up current. The rounded shape of the clasts reveal that they were tumbled by running water or moving waves.